Are you preparing for Valentine's Day in your classroom? Do you want to incorporate Valentine's Day into Math? 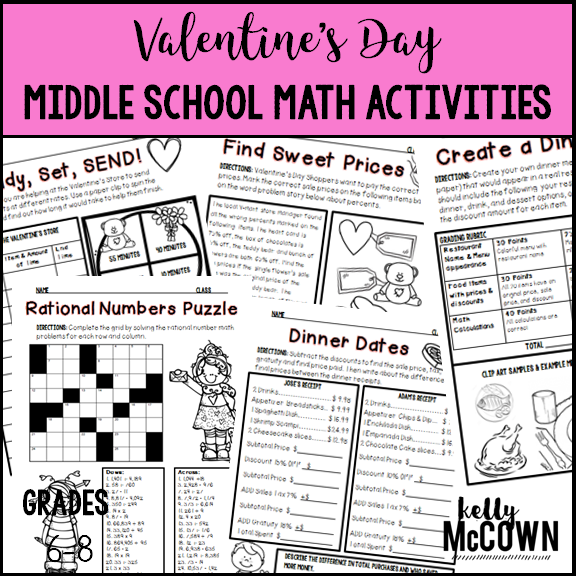 If you said YES, there is a resource that is NO PREP, print and go for your students to complete on Valentine's Day. Engage your students in fun and meaningful math on a very special holiday. 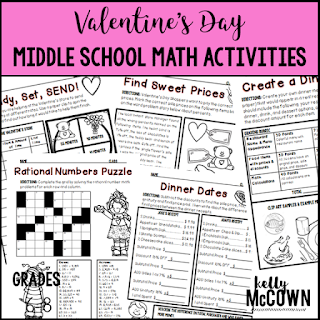 This Valentine's Day Middle School Math Activities NO PREP packet that will keep your sixth, seventh, and eighth graders engaged! This packet is just plain fun. Not only is it PACKED with grade level common core math problems, it also gives students fun coloring, puzzles, and problem solving. Use this packet for bellwork, classwork, extra credit, fast finishers, or homework. Valetine's Day is a holiday that is a big deal to every middle schooler. Let them know that you care for them and incorporate some sweet Valentine's Day activities for them too. It's a great way to make connections with students and have some fun. I hope these activities are a great resource for your classroom too.